The Spooner Lake area is a perfect place for beginners to start their ski touring career. 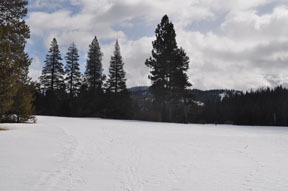 Two beginner tours, North Canyon Creek and Spooner Lake, give novices a place to practice basic ski techniques on easy to ski terrain. The North Canyon Creek tour, described here, is also the beginning of the intermediate tour to Marlette Lake. 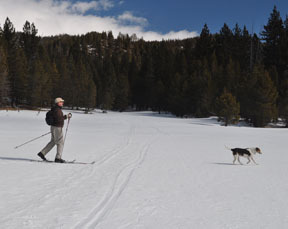 Turn south and ski south and then southwest for 0.5 mile through sparse trees until you reach a large meadow (5). In this section you may see some blue diamond markers from the previously groomed trail. Ski south across the meadow for 0.3 until you intersect a road (6). Ski east on the road for 0.3 mile until you reach the location from which you headed north originally (2).